Swede Jo Bonnier became the third different driver to win in as many races when he drove his BRM to victory at the Dutch Grand Prix - it was his and also the British manufacturer's first grand prix success. The result was well received as many inside the sport believed it to be a just reward for Sir Alfred Owen, one of the prime movers behind BRM, and engineer Tony Rudd, who had developed the P25. Bonnier took pole but at the end of the first lap was passed by Masten Gregory's Cooper with Stirling Moss and Jean Behra in close contention. On the 12th lap Bonnier regained the lead and Jack Brabham moved into second. Behind him a royal battle was taking place between eight cars. By halfway it was a three horse race between Bonnier, Brabham and Moss, and on the 48th lap to huge cheers Moss overtook Brabham and set off after Bonnier. A dozen laps later and he was within five seconds of the leader, but then yet another mechanical failure stuck and Moss limped into the pits with gear-box failure. There was a certain irony that Bonnier was sporting the No. 7 usually seen on Moss' car. 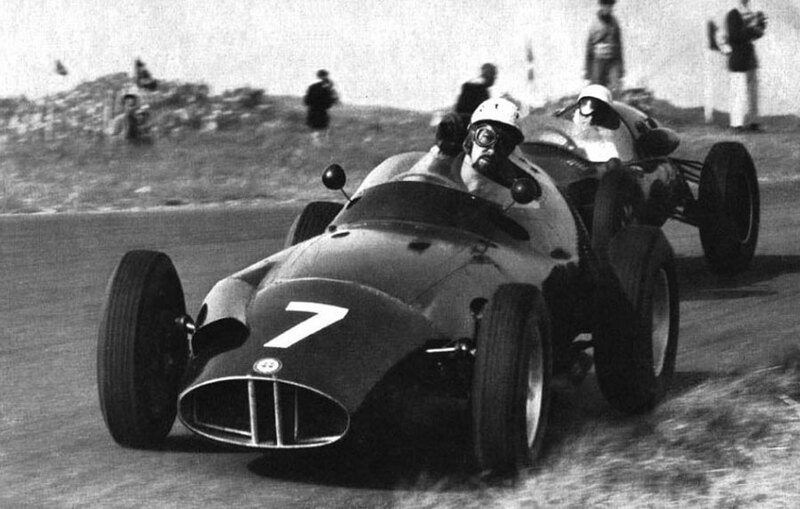 Jack Brabham pulled away from Gregory to take second place and the world championship lead whilst a new name, Scotland's Innes Ireland, scored his first points and the first for Team Lotus by heading the Ferraris of Behra and Phil Hill home.